In the Windows Control Panel, select Administrative Tools and click the ODBC Data Sources icon (the actual icon name may vary depending on your version of Windows; see “Selecting the Correct ODBC Data Source Administrator Version” below). Host IP Address  Specifies the IP address to be used by the ODBC connection in dotted decimal or dotted quad form, such as “127.0.0.1”. Host Port Number  Specifies the port to be used by the ODBC connection. The default for InterSystems is 51773. Authentication Method  Select one of the following options, depending on the security used for this database. For detailed information on these options, see “Authentication” in the Security Administration Guide. Password with SSL/TLS  authenticate using an SSL/TLS-protected connection (see “Using SSL/TLS” in the Security Administration Guide). Connection Security Level  Select Kerberos, Kerberos with Packet Integrity, or Kerberos with Encryption, as appropriate (see the “Client/Server” section of “About Kerberos and the Access Modes” in the Security Administration Guide). ODBC Log  Optional. If selected, specifies the creation of a log file of ODBC client driver activities for all InterSystems DSNs. This log is for troubleshooting; you should not turn logging on during normal operation as it will dramatically slow down ODBC performance. 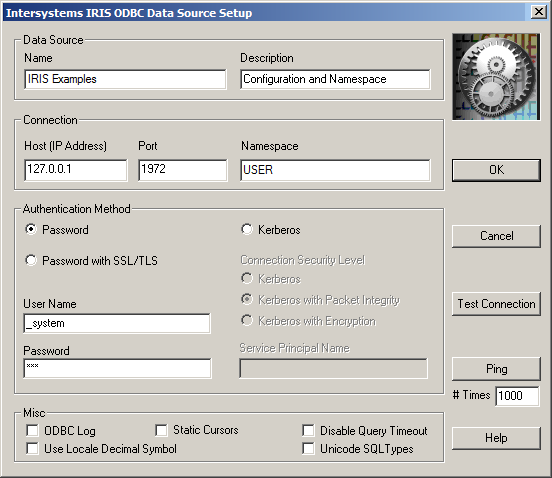 See “ODBC Logging on Windows” for more information. If an application encounters a “SQL data type out of range” error from the Microsoft Driver Manager using SQLBindParameter, it can be caused by having selected this check box. Windows also offers a set of Power Shell commands for manipulating DSNs from the command line. For details, see the Power Shell documentation for Windows Data Access Components (WDAC). On Windows 64-bit, use the Windows Control Panel ODBC Administrator to create user DSNs that function for both 32- and 64-bit programs. To configure a system DSN for a 32-bit program, run %SystemRoot%\SysWow64\odbcad32.exe. or it can specify a set of key-value pairs that specify the same connection information as a standard registry entry.